Proper advertising and promotion is critical for maximizing ticket sales. You might organize the biggest event in the city, but if you are not promoting it correctly, you are leaving money on the table. Most of you use social media websites and email marketing to promote your events; but in addition to social media, Yapsody gives you an opportunity to advertise upcoming events on your own Yapsody e-tickets through online ticketing system. Tickets are something that your customers carry for the entire event and can also take home with them afterwards. So having your future events promoted on your tickets helps for both brand and future event awareness. Sponsorship provide an effective means for expanding your competitive edge by fostering mutually beneficial relationships with other businesses. Sponsors can also be a meaningful source of revenue for presenters. 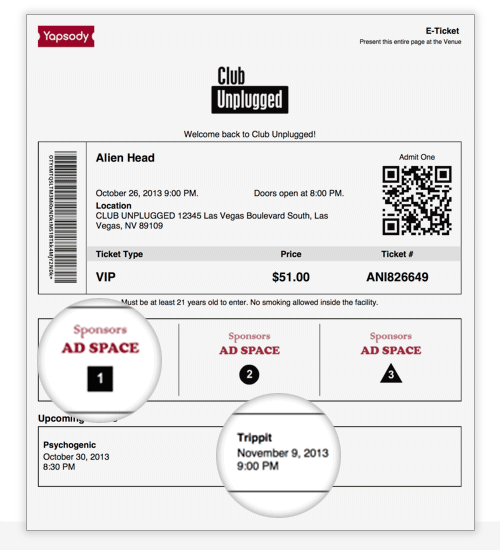 We at Yapsody understand the importance of sponsors for you, and because of that, we offer presenters a designated space on each e-ticket for displaying sponsors ads of their choice. Get maximum exposure for your events and your sponsors. Signup with Yapsody today and get the most out of your Yapsody experience.